Movie Review: One of the most wonderful surprises of this year is undoubtedly the Canadian drama “Tu Dors Nicole”, which has much to be appreciated. Exhibiting indolent tones and a leisured pace, the film grabbed me in a very satisfying way both in terms of script, whose creativity, spontaneity and even some surrealistic elements (like a kid talking with an absurdly deep voice) successfully enraptured me, and in terms of the engrossing black-and-white visuals, which were capable of making me feel the warm breeze and the relaxed ‘dolce fare niente’ of the summertime in a quiet, small Quebecois town. Julianne Côté, whose outstanding performance deserves all the accolade she can get, embodies Nicole, a young student who seems to be enjoying her time alone at home, a consequence of her parents’ absence for a prolonged vacation. The scene that first introduces her is illuminating - when she wakes up in the bed of a guy and responds in an indifferent manner to his question if they’re going to see each other again. Back at home, she receives a phone call from her father, reminding her of the home tasks to be completed, and finds an envelope in the mailbox with a credit card in her name. What a joy! This was exactly what she needed to fight the boredom of the hot days, mostly spent doing nothing special in the company of her best friend, Veronique (Catherine St-Laurent). Both are planning to leave their fastidious jobs and make a trip to Iceland, an idea that is reinforced when Nicole’s contentious brother, Remi (Marc-André Grondin), suddenly appears at home, bringing his longtime pal, Pat (Simon Larouche), and a new friend, the flirtatious JF (Francis La Haye), respectively bassist and drummer of his indie rock trio, to rehearsal. The multiple interactions among these characters suddenly change the airs from undisturbed to weighty. 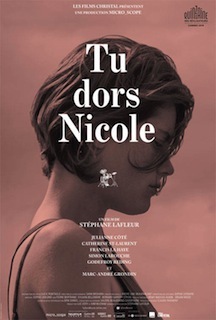 Directed with delicacy, intelligence, and insight by Stéphane Lafleur, who completely avoids one-dimensional characters, “Tu Dors Nicole” has this sort of mood that many emerging directors would like to bring into their cinema. It’s so effective and simple in its processes, so mature in depicting the human relationships, and so deliciously funny in its sometimes-offbeat posture and dialogue, that the result is an extraordinary modern gem not to be missed.